Air activity less pronounced, but Germans attack Southampton and Hastings; reported losses Germans 31, RAF 7. Ministry of Home Security announces that parachutes had been found in Derbyshire, Yorkshire and Scotland, but no evidence of Germans discovered. As Italians advance in British Somaliland, British evacuate Berbera, the capital. A plane crash in Canberra, Australia kills top Army officers and government ministers, leading to fall of Menzies government. 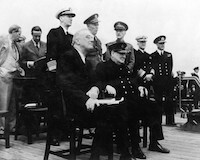 Roosevelt and Churchill sign the Atlantic Charter declaring general principles for a free post-war world. President Roosevelt announces US will not allow U-boats to attack British shipping in western hemisphere. Franciscan priest Maximilian Kolbe volunteers to be executed in place of a condemned man at Auschwitz; he will be canonized. 74% of Americans still oppose war. German forces cross the upper Kuban river at Krasnodar in the Caucasus. The Eighth Army is now only 29 miles from Messina. Italy declares Rome to be an open city by Italians. by the military. This gives the armed services enough beer for each soldier to have a bottle a day, except on Sunday. Roosevelt and Churchill meet at Quebec where they initial the Morgenthau Plan that calls for the divisionÂ of post-war Germany and its transformation into a purely agricultural country. Monty launches Operation ‘Tractable’ towards Falaise with a carpet bombing by 800 planes. The Russians begin an offensive from their Vistula bridgeheads, 100 miles to the South of Warsaw. Chiang Kai-shek’s representatives sign a treaty of alliance with the Russians. USAAF B29’s launch the last air raid of the war against Kumagaya. Japanese military coup and assassination attempt on Emperor Hirohito fails, and Hirohito signs acceptance of unconditional surrender. The US government orders resumption of civilian car manufacturing.